If your team is brand new to the TeamUnify platform but not a brand new team, you likely have accounts who currently owe money. These steps will help you enter those balances so that the SwimOffice Billing System can pick up where your old billing methods left off. One approach is to create a “Balance forward” chart of account (CoA) and add that to those with outstanding balances. Another is to add all invoice items for which people owe using the correct CoA for each. 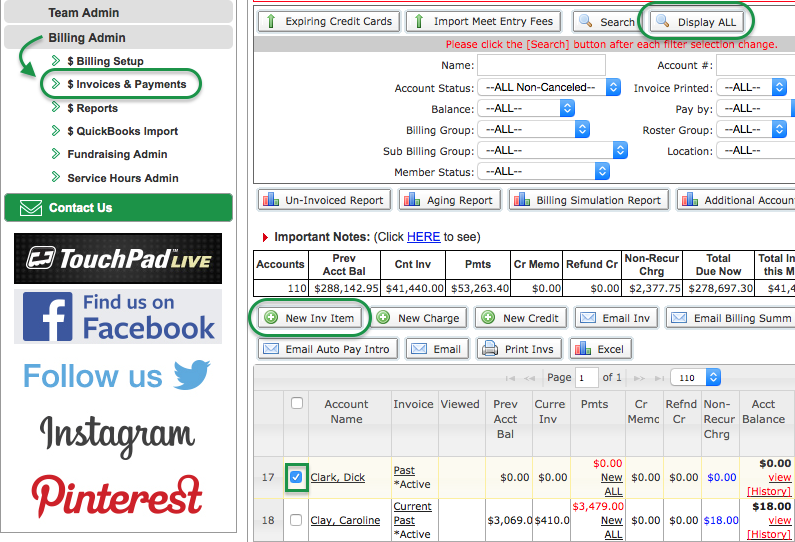 In the side menu click Billing Admin > $ Invoices & Payments. Click Display ALL. This will show all non-canceled accounts. Click a check-box next to an account with an outstanding balance. Enter the “Invoice Item Description,” such as Balance forward or March dues. Click Select to the right of the desired Chart of Account. Click Save New Invoice Item. Repeat for each item, each account. If you have any canceled/hidden accounts that owe money, set the “Account Status Filter” to Canceled/Hidden, click Search, and repeat steps 3-10 as needed. Note that Canceled/Hidden accounts also get charged late fees on outstanding balances. Run the Billing Simulation Report once again to confirm that all charges are correct. If your team is brand new to our system and you are about to run your first Online Registration, you can include those balances everyone owes when they register. See our Knowledge Base article, Enforce collection of outstanding balance through Registration. Congratulations! Your Billing System is all set up and ready to roll. As an afterword, we’ll cover some Billing System management basics.